LedgeWall panels from Brewer's Ledge are sculpted, prefinished climbing panels that can create cost-effective climbing or traversing walls in a number of different ways. 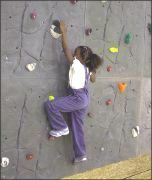 Applied directly to walls, they provide attractive traversing (sideways climbing) areas in gymnasiums and play areas. With structural framing, larger walls can be created. Pre-framed LedgeWall Modules are designed to bolt together to create exciting bouldering installations such as islands and racquetball-court conversions. With 54 pre-installed threaded inserts in each panel, LedgeWall offers unlimited potential for route-setting and new challenges. LedgeWall panels are made of high-quality double-sided MDO exterior-grade plywood for indoor and outdoor use. The Eldorado Wall Company offers the new Hybrid Climbing Wall System that combines the best aspects of its RealRock system and the popular High Performance concretious system for superior aesthetic impact and versatility. Seamlessly focus attention on the most highly visual features of your wall, while maintaining the cost-effectiveness, versatility and route-setting options of High Performance. More than 30 custom-dyed colors, molded in fossils and three RealRock stone types allow your climbing wall vision to come to life. While racquetball participation rates declined 9 percent in 2000, sport climbing grew 27 percent. This offers fitness club owners a new revenue stream without the need to expand their facility. In a partnership with Pyramide Climbing Wall System, W.A. Schmidt offers a complete sports climbing gym within an existing racquetball court. With Pyramide's Modular Sport Climbing Wall system, the panels can be rotated and swapped to create unlimited climbing patterns. 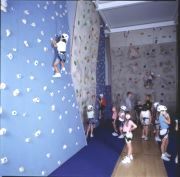 The climbing walls are self-supporting, allowing them to be removed and relocated. The steel frame won't damage the court's walls or floor, and installation requires no heavy equipment or welding. New Nicros-EasyWallTM will add excitement to any location where it's installed. Nicros, Inc. is a nationally renowned rock climbing wall construction company. Besides the custom climbing wall installations that Nicros is known for, Nicros designs and manufactures a full line of rock climbing handholds and distributes a full line of climbing gear worldwide. Nicros-EasyWallTM is a uniquely designed rock climbing wall panel system that is named "Easy" because installation is as easy as bolting it to an existing wall. In the past, rock climbing has not been a viable option for recreation centers due both to the cost and to the amount of space it occupies. With new Nicros-EasyWallTM , rock climbing can be available to people at any recreation facility. Landscape Structures offers the Conical Climber, a new playground activity that features real climbing gym-style handholds mounted on a flexible, high-strength PVC material. The unit provides the challenging rock climbing experience that kids love, and it can be used with the PlayBooster and PlayShaper systems from Landscape Structures. The reinforced PVC belt material used on the climbers is mounted to a tubular steel frame that is anchored to the ground. The movement of the flexible material within the frame provides an added challenge to climbers as they make their way to the top. Red Rock climbing panels offer state-of-the-art modular panel system construction. The polyurethane plastic molded panels are crafted from natural granite impressions, creating a realistic look. An extruded T-6061 aluminum frame is designed into the body of each panel, eliminating the need for elaborate steel structural framing behind the climbing wall. The walls require minimal carpentry sub-framing for the purpose of wall attachment and provide a seamless climbing surface with aggressive "relief." Each 4-foot-by-4-foot panel creates 22 to 25 square feet of actual climbing surface. The walls take up minimal floor space and provide portability, allowing for easy repair or relocation. Extreme Engineering offers stationary and mobile climbing walls that look realistic and come complete with a limited lifetime warranty, auto-belays and all the climbing gear. Each wall is handmade and painted to be durable for indoor or outdoor use. Used by NASA, Six Flags, Disney and numerous fitness centers, the systems hold between three and 10 climbers depending on climber. Stationary solid systems rise up to 25 feet, are pre-assembled, install easily, and can be mounted freestanding or against a wall. With stationary panel systems, stackable 4-foot panels can be built up to 32 feet high in a various configurations. Sport Rock has created some of the most realistic replications of natural rock climbing walls in the industry. The state-of-the-art fabrication process allows Sport Rock the flexibility to incorporate nearly any natural rock feature into the climbing walls, accommodating the specifications and requirements of each individual project. The wall design and construction is performed by licensed architects, engineers and contractors to meet or exceed CWIG standards. Sport Rock experts can help your professional staff provide the necessary plans and specs for you to make your wall a success.